The Drager Polytron 3500 is a transmitter for the continuous monitoring of NF3 and PFCs (perfluoro compounds) e.g. C4F6, C5F8 in ambient air. It is the basic version of the new Polytron Pyrolyzer family from Drager. The transmitter provides all necessary functions like sampling, processing and analyzing in one housing. A gas sample is drawn in by an internal pump and fed through an oven-type device which cracks the target gas at high temperature. Subsequently the gaseous exhaustwill be measured by means of an electrochemical DragerSensor. A two component concept comprising adocking station and a main unit saves timeand money. The docking station can be electrically pre-installed. 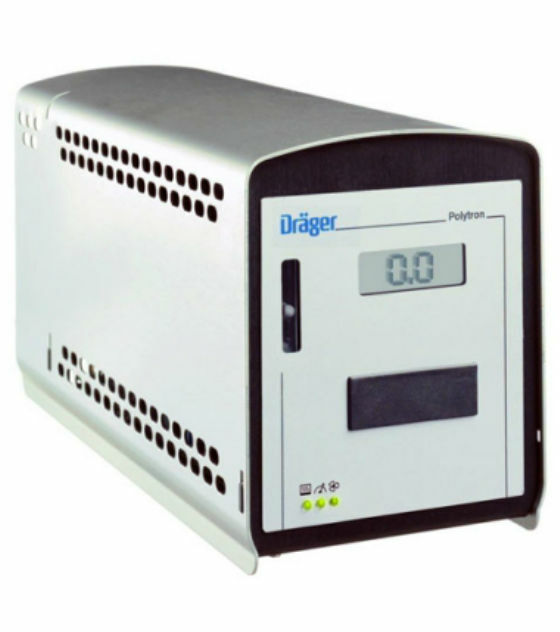 At commissioning the Drager Polytron 3500 main unit is connected by a quick-lock mechanism to the docking station. After warm up the system is ready for operation. The design supports the demand for a small footprint where space is limited. The Pyrolyzer requires almost no handling, tuning or adjustments. The 4 to 20 mA output signal with additional special status signals can easily be connected to any controller system for further signal processing. Through new technological advances in electronic design and a shielded full metal housing, Drager Safety was able to provide transmitters with unsurpassed RFI resistance. The use of durable and sturdy components for pumps and pyrolysis oven enables long reliable operation. Selective electrochemical DragerSensors provide a stable and long-lasting measurement of dedicated target substances with a fast response time. A unique branched flow system allows for a wide flow range from 0.5 to 1.3 l/min without interfering with the measurement performance. Two electronic flow monitors care for safe operation.